Use the best window weatherstrips and gaskets to keep the weather out! Operable windows can be grouped by the type of weatherstripping they use, either sweep or compression. Window weatherstrips are the flexible material that runs continuously between operable and fixed elements of a window to repel air infiltration and water penetration. Double hung, single hung, and sliding windows and doors all utilize window weatherstrips that slide or sweeps between the sash and the frame. Such weatherstripping must be tolerant of shearing movement while still maintaining a seal. Fuzzy piles, sometimes accompanied by a plastic or Mylar fin, are frequently used for this purpose at the perimeter of the sash, or along the frame where the sash meets the frame. Image above left: Sweep-type weatherstripping with Mylar fin (arrow) embedded in the pile for better control of air infiltration. The original trade name, fin-seal, has now been popularized to represent all such products. Right: Sweep weatherstrip without fin. The rigid backer threads into receiving slots that run along the sash or frame. In the sectional detail through the top (also called the head) of an aluminum thermally broken double hung window, the master frame has been coded yellow. The sash is blue. The two thermal breaks are gray. The two window weatherstrips are colored orange and circled. The weatherstrip on the left is threaded into the sash and weathers (rubs and seals against) against the master frame. The weatherstrip on the right is threaded into the master frame and weathers against the sash. 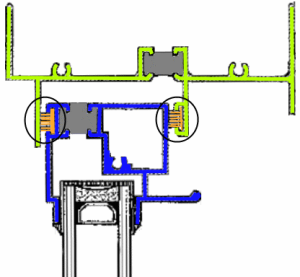 All other operable window types utilize compression weatherstripping, such as bulbs or fins. These tend to seal better that sweep-type window weatherstrips because they are actually compressed between sash and frame when the sash is locked in the closed position. Compression weatherstrips can also be called gaskets. Standard/Specification for Windows, Doors, and Unit Skylights. 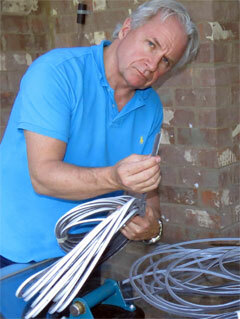 Image above, at left: Bulb weatherstrip with a rigid backer for threading into a slot which has been extruded into an aluminum or PVC sash or frame. Right: Bulb weatherstrip equipped with a “double-dart” designed to be permanently pressed into a slot cut along the edge of a wood window frame or sash. These window weatherstrips are extruded from vinyl, TPEs (thermoplastic elastomers), PVC, silicon, polypropylene and jacketed foams. There are literally thousands of window weatherstrips available on the market, varying by material, size, thickness, and backer configuration. If replacement window weatherstrips are needed, the best way to achieve success is to obtain a sample of the material, measure it using a caliper-type micrometer, detail it and send it to various suppliers, even accompanied by photos of the material. If any suppliers claim to have a matching product, request a sample and compare it with your original. Window weatherstrips and gaskets are designed to be compressed when in service. The window manufacturer will select a particular weatherstrip type for the product, and will decide, possibly in coordination with the weatherstrip manufacturer, to what extent the weatherstrip should be compressed. This decision must be made judiciously. If the window weatherstrip is compressed too hard, meaning it is too thick for the space in which it resides, the window will be difficult to operate. If weatherstripping is too loose, excessive air infiltration or even water penetration could result. As windows are operated year after year, many weatherstrips will remain compressed even while not under compression. This is called “taking a set” or having a “memory”. Other products may erode over time, loosening the seal. Therefore the choice of weatherstripping material and its initial compression has large ramifications for the functionality of the window product not only when it is new, but also for many years in the future. Here we will discuss the frame of the window. Glass, the thing that makes a window a window, will be discussed later. Window frames are commonly made from extruded aluminum, extruded PVC, wood and wood that has been clad on the exterior with aluminum or PVC. A newer product, combining the strength of aluminum with the thermal resistance of PVC, is a fiberglass pultrusion. Historically, windows were also made from rolled section or hollow metal steel and there is a market for these products now. The material chosen for the window frame, combined with its accompanying manufacturing processes have evolved frame designs that are peculiar to the material. 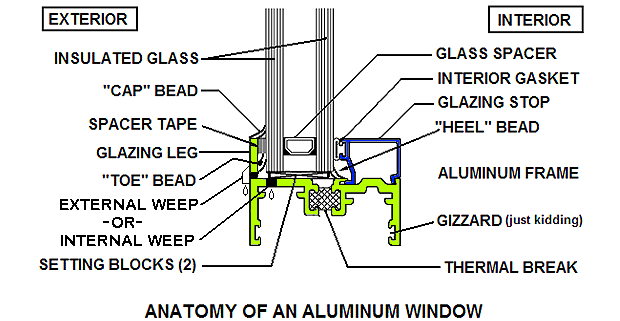 Above, Anatomy of an Aluminum Window. 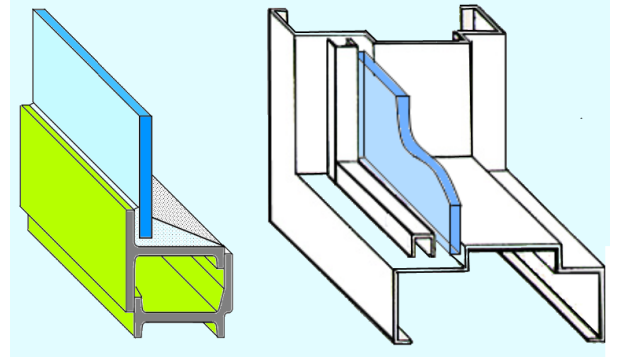 Sectional detail of a fixed aluminum window shows that the core of the frame (yellow) is a highly detailed series of walls. In commercial windows, these walls are often 1/8” (.125”) thick. The extrusion process, along with the formability of aluminum, allows intricate shapes that are highly functional. A thermal break can be added to the frame to reduce thermal conductivity. 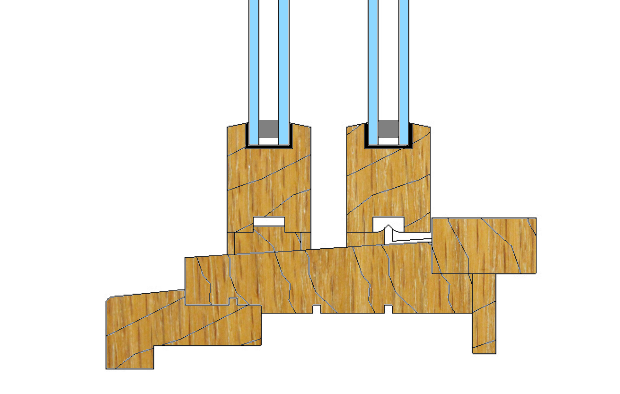 A separate glazing stop (blue) can be extruded to neatly snap into the main extrusion and hold the glass in place. Aluminum is reactive to changes in temperature, and its coefficient of thermal expansion must be considered, especially when designing larger assemblies. PVC is easily and accurately extruded, but its strength does not compare to that of aluminum. PVC’s softness and low melting point allow the extruding of multiple hollows within a single frame section – something far more expensive in aluminum, which increases the much needed strength of the PVC frame. PVC is highly reactive to temperature changes and is available predominantly in white. These factors should be considered when selecting product for a project. 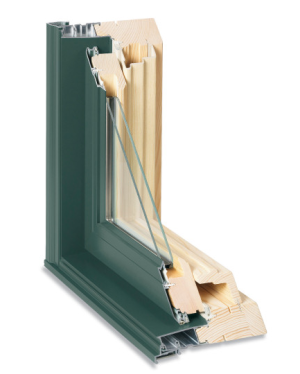 Sectional details and thermal conductivity of fiberglass windows are similar to extruded PVC, however the fiberglass is much stronger than the PVC. The wood profiles (there are at least 6 unique shapes in this detail) are milled from larger pieces of lumber, making the fundamental manufacturing process quite different from the extruding processes of aluminum and PVC. Because of this, the sections tend to be solid, rather than being comprised of a series of extruded connecting walls. Wood is reactive to changes in humidity. It swells in the presence of moisture and usually shrinks back when moisture reduces. Protecting the wood against weather and moisture is a necessity, and ongoing maintenance is critical. In the image at right, wood (right side) is exposed to the interior while protected on the exterior by aluminum cladding. This design, sometimes using a PVC cladding in lieu of aluminum, is commonly used in residential construction. Above, rolled section steel windows (left) and hollow metal steel windows (right) still have a place in current construction and are both available. The rolled section steel provides some of the narrowest sightlines available. They are favored in historic renovations as well as interior partition applications. Hollow metal sections are frequently used in fire-rated partitions along with hollow metal doors.